Missing Multiple Teeth? Dentures Restore Your Smile! If you’re missing multiple teeth, just know that you are not alone. Forty million Americans are estimated to be missing all of their teeth, and about 178 million Americans are estimated to be missing at least one tooth. Since tooth loss only increases the risk of future tooth loss, now is the time to start thinking about replacing those teeth and preventing the inevitable effects that come with it. When you visit BGH Dental, the dentists can create a denture that fits your mouth precisely and comfortably. Thanks to their versatility, it’s easy to replace several teeth or an entire arch! By contacting our office today, you can get started restoring your smile and making your daily life easier and more enjoyable. To start, there are two types of traditional dentures to consider. These include partial dentures and full (complete) dentures. Partial dentures are designed to replaced several teeth at a time, typically on both sides of a specific arch. They are ideal for those who need to replace more teeth than what a traditional bridge can replace, but still have remaining teeth that the partial can properly hook onto. The denture itself is typically made with a metal base, but the visible portions like the teeth are made entirely from porcelain. The area around the crowns may also be pink in order to better blend in with existing gum tissue. 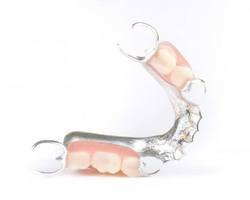 Full or complete dentures are designed to replace either one or both arches at a time. Full dentures are typically created with more cosmetic detail in mind and typically fabricated entirely out of acrylic and porcelain. The acrylic portion makes up the gum tissue while the porcelain makes up all the individual teeth. Unlike partial dentures, full dentures are meant to be held in place via the natural suction of the gums. As you adjust to the denture, you may also use denture adhesive. This material helps your mouth get used to wearing it over time, but should not be considered a permanent solution. If you’re missing all of your teeth and don’t intend on getting dental implants any time soon, then full dentures are likely the most appropriate option. However, those with several missing teeth, especially on either side of the mouth, will have a lot to gain from partial dentures alone. In this instance, it’s always best to speak with one of our dentists. They’ll go through all the details of your treatment and make sure it fits comfortably. Over time, you will need to have your denture relined as your mouth continues to change shape. With proper care, your denture will last several years before needing any kind of replacement.